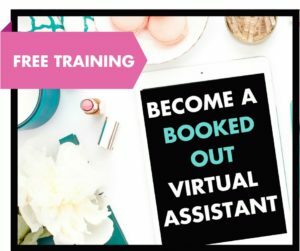 When I first started my virtual assistant business I had no idea what I was doing, no marketable skills, and no plan for offering a specialty in my business. If there’s anyone that understands this, it’s me; It can crazy overwhelming to learn “all the things”. You’re on the phone with another potential client who asks if you know how to do “xyz” and you have to (yet again….) say “No, I don’t have experience with that program”. What if you had a resource at your disposal that taught you the tech you need, when you need it? That’s exactly why we decided to create The SavvyTech Lab. 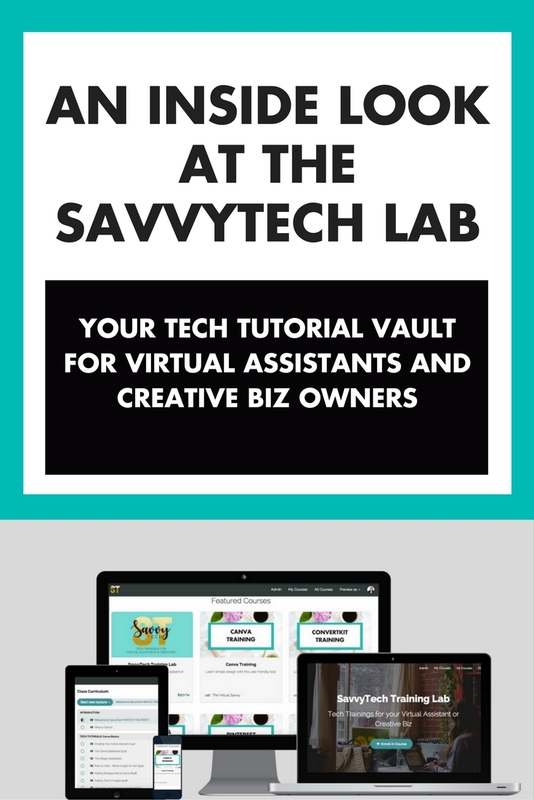 The SavvyTech Lab is a membership site designed to teach virtual assistants and creative entrepreneurs the techie skills they need to be successful in their online business. We’ll be adding new courses every month that YOU get to choose. That’s right – you get to vote on the course that you want to see next in the SavvyTech Lab. But we’ve gone ahead and added some of the most in-demand services for you. 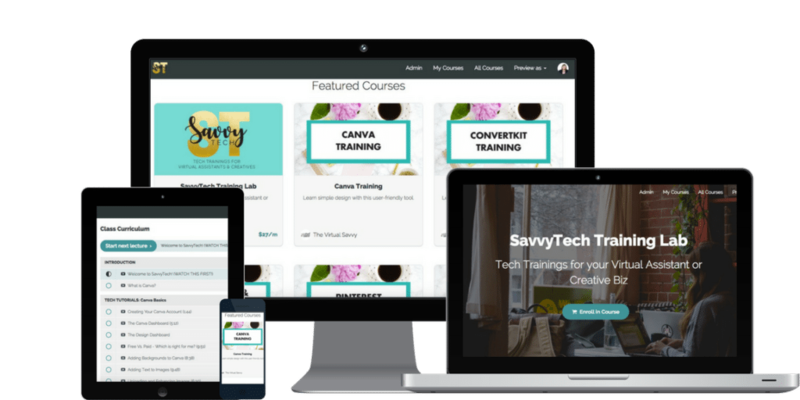 Since The SavvyTech Lab is a membership community, it means that as long as you are a member you will have instant, unlimited access to all of the courses and tech trainings we have in the lab. Now, I’ve been getting quite a few questions about The SavvyTech Lab, since we opened the doors. I thought I would take some time to answer some of our most common questions. YOUR QUESTIONS ABOUT THE SAVVYTECH LAB, ANSWERED. Can I get an inside look at The SavvyTech Lab? When will I get access to the training material? You will gain immediate access to our video training material after you’ve joined The SavvyTech Lab. Some bonus content, such as the members-only community, you will get access to within the first week after you join. What if I only want access to a few of the courses? Can I purchase them individually? If you only need one course, no problem. Simply join the lab and take the one course, and then cancel your membership. The SavvyTech Lab is a month to month membership subscription. You will be billed every 30 days for access. Find that you don’t need the courses anymore? Simply cancel your membership. You can stay in the SavvyTech Lab as long as you need access to the Tech Trainings and Membership Community. I’m thinking about waiting to jump into the SavvyTech Lab. Is there any reason I should join now instead of later? In the future, as the content and value of the SavvyTech Lab increases, so will the price (there actually is a fast-approaching deadline for when the current rate will increase!). Think about this – how much TIME are you wasting trying to figure out what new services to offer and looking up YouTube videos and blog posts on the topics (that usually lead you no where!)? Time is money. The time you save getting DIRECT access to the tutorials you need gives you more time to go find PAYING CLIENTS! Ready to learn the tech you need to master your online business? Click here to join The SavvyTech Lab for just $47 per month. What are the TOP tech skills you want to learn to improve your online business? I find your courses very interesting. Though I just want to make few suggestions, maybe you should also include trainings about building strong profile on different platforms. And also indepth tutorials on making cover letters. Anyway, will there be promos for the courses in the future? Thanks a lot! I’m glad you’re liking the courses and finding them interesting. Also, thanks for the feedback; it’s always appreciated. And yes, we will offer promos in the future with the next Bootcamp launch in January.